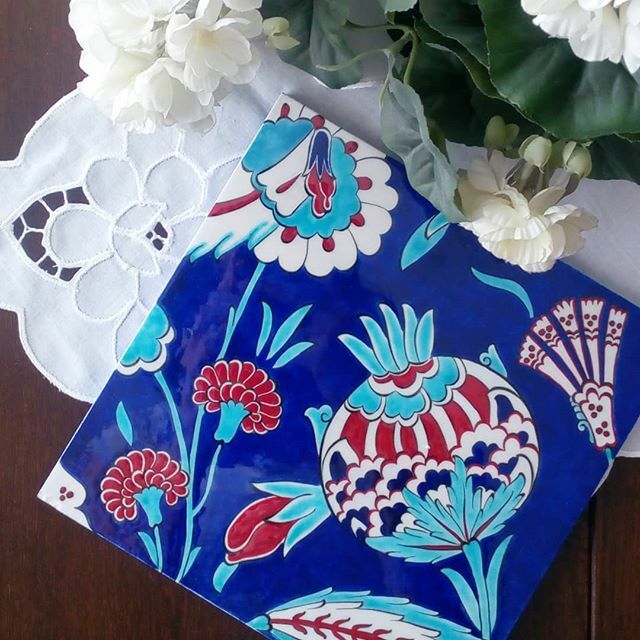 I’ve recently been wondering which of the Turkish ceramic patterns I find most attractive and why, in the hope that as I develop my own style I can create some pieces influenced by the classics. Whilst travelling through the İstanbul metro the other day I found some tiles created by the wonderful İznik foundation which I couldn’t resist photographing. 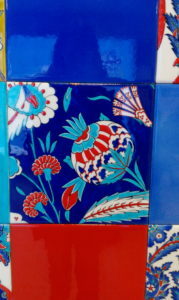 One of my favourite was a stunning tile with bright red and turquoise details on a dark cobalt painted background. I decided to challenge myself to reproduce the piece as a study and emulation challenge. 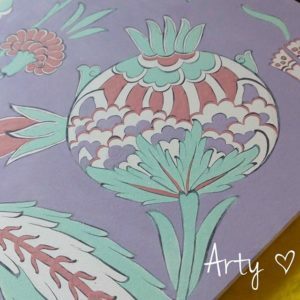 Above is the tile I painted pre-firing, with the background painted with the infamous ‘pink cobalt’ that magically changes to be dark navy blue upon firing… The main feature picture is how my replica turned out…! I’m thrilled. It came out better than I’d hoped! What an encouragement to keep going – I’m on the right track.